2 Big: Get Real And Stop Dieting - Book Giveaway! 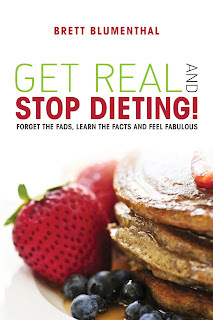 Get Real And Stop Dieting - Book Giveaway! We all know there are many books published all the time about dieting, and most of them in my opinion are not worth the paper they are written on. Most diet books tell you what you have to do to lose weight and in many cases there is some extreme steps that need to be taken or strict rules to follow. I won't even get into the books that are just pushing a product. I have not had a chance to read the entire book yet, but from what I have read so far I have found it to be an easy read and really just about the basics that will seem like common sense when you read it. The problem is that even though a lot of it is common sense we tend to forget about these or think they are too easy. The first part of the book are the "Get Real" Principles and cover things like keeping it whole, natural, and simple. Some of the other chapters in this part of the book are about focusing on fiber, lean proteins, and healthy fats all of which were things I learned during my 90 pound weight loss in 2007. My favorite chapter in this part of the book is the fifth chapter called Eat Small, Often, and Mindfully. The reason I say this is because this was one of the biggest keys for me in my weight loss, and is also something I need to get back to with a little more consistency. Brett wraps it up with 40 pages of simple, satisfying recipes and even includes some desserts! I have been provided with a copy of this book for one of you to win. If you would like to get your hands on it right away you can purchase a copy of Get Real And Stop Dieting from Amazon.com in both paperback as well as kindle. If you would like more information on the book or the author you can visit the Facebook Fanpage, follow her on Twitter, or visit the book website. To win a copy of this book just leave a comment below. If you would like additional entries please share this giveaway any way that you would like and let me know in the comments. The giveaway will run through April 5th and is only open to US mailing addresses. I will choose the winner via random.org on the 6th. Sounds like a good book , must check it out. I agree with the focus of the fifth chapter, "Eat Small, Often, and Mindfully." Having been able to keep a loss of 40 pounds consistently for about 30 years, I can say that this is key. Since there were only two entires, I will be giving one of you the winners copy and the other one will get my copy when I am finished reading it.